Notice distorted sides and wavy bottom on this quilt. of the quilt, such as puckers or tucks, or getting to the bottom of the quilt and find dog-ear borders. It is very discouraging after spend a lot of time to make the quilting design look so nice. Who at this point wants to do reverse stitching (pick out stitches)? Perhaps, even by removing the stitching, there may not be a good solution to fix the issue. The backing is loaded too loosely. Because of inexperience, new longarm quilters often have backing issues, even I did. All of these issues are caused by incorrect methods. Change your methods and you immediately change the outcome. The best solution to “fixing” these issues is prevention using techniques that will eliminate the problems from the start. In fact, prevention starts even before you start loading the backing. Over the years I have refined a procedure that totally eliminates all of these issues. If you follow these steps, you can eliminate these issues. Best thing is that these same procedures and techniques work with all brands of machines and frames. Techniques to eliminate puckers, tucks and dog-ear borders. Dog-ears result from the border being longer than the quilt top or being stretched during quilting. “An ounce of prevention is worth a pound of cure.” In this case, add borders correctly. Never add a border by laying the strip on the quilt, stitching it on and trimming it off. Because the sides of any quilt will distort easily, opposite borders will never end up being the same sewn on this way and you end up with opposite borders all different lengths distorting the outside edge of the quilt. Borders added correctly will square up a quilt. Measure across the quilt top in two or three places (not at the top or bottom), use the average of the measurements or the smallest, cut both top and bottom border at the same time, the same length. Pin border to quilt easing in any fullness of the border or quilt. Best way is to quarter both the quilt top and border, pin together at the quarter marks, then ease in fullness. Always stitch with the fullest piece on the bottom where the feed dogs will evenly pull it through without creating any puckers. Using the same method, measure the other direction across the quilt, cut both border strips the same length following instructions in steps A-C. Backing (and batting) must be 8” longer and 8” wider than the quilt top. Square the top and bottom end of the backing so that they are perpendicular to the sides. Fold backing in half lengthwise, fold again making sure there are no puckers and the folds and side lay on top of each other with no ripples or puckers. Use a long cutting ruler and line up a cross mark along the folded edge and trim the top (and bottom) edge. Cut will be perpendicular to the length of the backing. Your backing will NEVER work properly without squaring with this method. Even tearing along the grain line does not work because all fabric is distorted during the manufacturing and winding process. You must square by cutting. Make sure the backing is pinned evenly to the canvas or zippers, or with the same amount folded over the rod if using leader grips. Any amount that is off by more than ¼ – 3/8” here can distort the backing. Always roll ALL of the backing onto the take-up roller first (roller under the machine arm). Stand at the back of the frame, roll a little, then, SMOOTH the backing from the center outward in each direction. This does not stretch the fabric, it smooths it out to remove little puckers and ripples. Keep rolling a little and smoothing until nearly all of the backing is rolled onto the take-up roller. 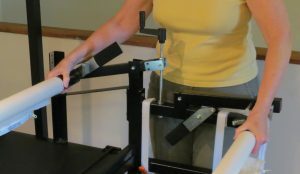 Controlling transfer of backing from take-up roller to belly bar roller. over and smooth from center outward in each direction (belly bar), roll a little more, smooth more, until the backing is transferred to the front belly bar roller. When transferring from take-up roller to front roller, keep tension on the backing by keeping a hand on each roller (see photo). Something magical happens during this transfer – the backing straightens itself out, drapes along the side disappear. YES, this method takes a little longer, but it eliminates the problems. What about a backing seam? Unless the backing is directional, always seam backing fabrics so that the seam is a horizontal seam and not a vertical seam. If you must have a vertical seam see my YouTube video below on how to roll the backing. Once the backing has been transferred to the belly bar roller, the batting and top can now be loaded. Do not put clamps on the quilt yet as this distorts the backing. Batting must have a straight edge at the top perpendicular to the sides. If it does not and/or is distorted, square up the top edge of the batting. Baste the batting to the backing with the horizontal channel lock engaged. This is very important as the basting line becomes the placement line for the top. Using the basting line (step 2) as the placement for the top edge of the quilt matching the center of the top to the center mark on the roller. 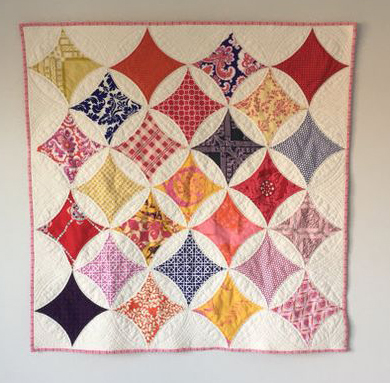 The quilt top will be perfectly aligned parallel to the rollers and square with the frame. Baste less than ¼ “ from the edge of the quilt top. When basting less than 1/4″ from the quilt edge, there is no need to remove the basting as the binding will cover the stitching. Using a zero center tape installed on the frame, baste the sides of the quilt top at the same distance from the center as the top edge of the quilt. Using a zero center tape every time the quilt is advanced assures the quilt will be square at the bottom. After the top is basted to the backing, attach the clamps only to the backing. Backing clamps are used only to stabilize the sides of the quilt and are only attached to the backing. Side leader grips can be used as an alternative method of stabilizing the quilt/backing sides. These are 10-14 inches long with the ribbon on the side leader grip held by a frame side clamp. They do a great job of stabilizing a longer area than just a narrow clamp. DONOT pull tightly on the clamp straps as that distorts the backing. Because of this distortion, when the clamps are released after quilting, the quilt will pucker. One final tip. Before starting to quilt the new area, take a quick look under at the backing. Make sure that it is smooth with no ripples, folds, or areas of distortion. If it looks smooth, you are good to go.